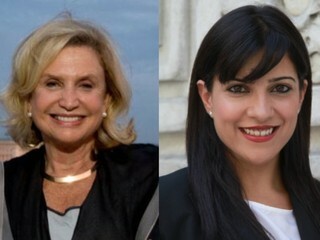 It’s taken some two months of bickering (and felt like six) but Congresswoman Carolyn Maloney has finally agreed to debate challenger Reshma Saujani a week before the September 14th primary for New York’s 14th District. Thanks to Celeste Katz at the Daily News for being beyond patient in continuing to cover this topic. This is terrific news, the East Side of Manhattan and Queens will have its first debate in eons. File into the auditorium, dim the lights, dab on some makeup, and let the cameras roll. I hope Gabe Pressman comes out of the woodwork for this one! Wait–what’s that you say? The debate’s not going to be on TV? Why not? Can I even go see it in person, Lincoln/Douglas style? No!? Then, where is it? And how will we know who is wearing the infamous Kate Spade wedge? It’s on the radio? What’s that, some doohickey that emits live podcasts? Sounds experimental. Well, okay. I suppose I can just sit down and listen to it after I eat dinner, brandy snifter in hand in my favorite chair. Huh? It’s on in the middle of the afternoon on a Tuesday? But who can listen to it then? Wait, why would Carolyn Maloney suggest this? Oh, I think I cracked the code on that one, along with anyone else who spent a second considering it: she’s afraid she has a face made for radio. Maloney’s 64, Saujani’s 34. She doesn’t want to look old next to someone more dynamic and energetic like Reshma, who has probably crossed the East River campaigning more times than the Roosevelt Island Tram. Vanity being what it may, this is not a beauty pageant. It’s about seeing how these women conduct themselves in a formal setting, how they parry and thrust in reaction to each others’ arguments, and who displays the conviction and poise to represent the district going forward. Being good in-person is important to being good in Congress. Maloney also wants to avoid a larger, accessible forum for the reasons any politically expedient incumbent would: she doesn’t want to give Saujani added exposure and an appearance of equality and legitimacy standing up there next to her. In addition, having to debate at all opens up the possbility of a Maloney gaffe. As I’ve noted (in addition to Saujani herself), these two would probably vote the same in 80 or 90 percent of circumstances, so perhaps this whole race is just theater. However, it is important to have a representative who is actively proposing original legislation, as well. It’s hard to say where this race is right now with a lack of recent polling. Reshma probably has the momentum, but how far up the hill will it push her? I’ve seen more Reshma placards pasted around restaurants and bodegas in my neighborhood than I expected. But Maloney has more cash and cache. Thus, we’ll see. All we can hope for now is a high radio drama, perhaps with thin pieces of aluminum shaking to emulate thunder. A smuggled-in cell phone camera wouldn’t hurt either. Honestly, more than one was always a stretch, but one is warranted. Yes, radio is FDR, but I highly doubt this debate will come off like a fireside chat. Rather, I was referring to the disparity in reactions to the Nixon/Kennedy presidential debates of 1960, in which those who listened on the radio felt Nixon won, whereas those who saw it on TV felt Kennedy prevailed. The persistent perspiration of Nixon’s upper lip didn’t help. Even on the radio, I hope neither Reshma nor Carolyn sweat like that. Oh, right, women don’t sweat; they glisten.